Thank you for submitting. Your download should start automatically, if not Click here. 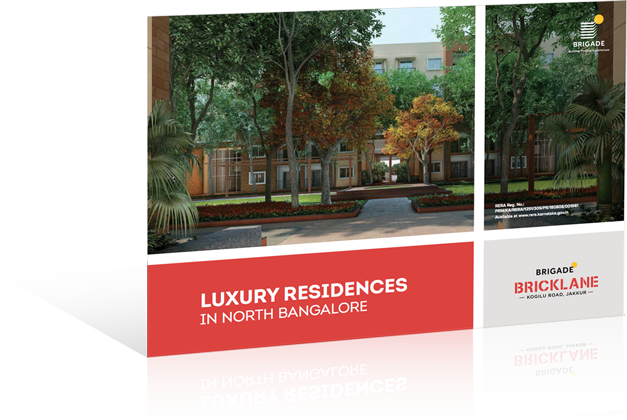 Brigade, one of India’s leading real estate developers, newly launched yet another luxurious project in North Bangalore, Brigade Bricklane, stylish homes on Kogilu Road, Jakkur. These luxury apartments in North Bangalore are designed for trend-setters and game-changers. The apartments for sale at Brigade Bricklane have been designed around a vertical & horizontal green axis -in a configuration of G+4 floors with inter spread gardens between each block of apartments. Each block overlooks into an open space that forms the network of visual connectivity. Brigade Bricklane is a low-rise residential project in Jakkur, offering 1, & 2 bedroom homes. The project is strategically located on Kogilu Road enroute the International Airport & in close vicinity of the Manyata Tech Park and offers a gamut of comforts including proximity to shopping malls, hospitals, and schools. The project offers a world of amenities like Clubhouse with swimming pool, gymnasium, tennis court, children’s play area, skating area, convenience store; amphitheatre, meditation center and more. The realty market has been seeing a steady rise of youngsters looking for homes that suit their style. Brigade Bricklane is the on-going residential project for such trend-setters & game-changers that blends in modern conveniences with an enriching lifestyle.